A young man, straight out of high school, with hopes of a dramatic stage career, hangs around the Edison Company studio, watching the actors, stars as well as lowly extras, walk through the gate. Unable to get work in the legitimate theater, he has turned, temporarily he hopes, to films. But access is denied. All of the directors have their favorite extras, and all of the favorite extras have passes to get through the studio gate in the morning. Unknown, with only one day of work in the movie industry on his resume, playing a Yaqui Indian no less, the man waits and hopes. One day, however, he notices that when all the extras return from lunch, in full makeup, no one asks to see their passes. He devises a plan right there and then. Dawdling away his morning, the young man makes himself up lavishly during the noon hour and joins the returning crowd at one o’clock, slipping in, with a casual wave to the gateman, for the afternoon shooting. 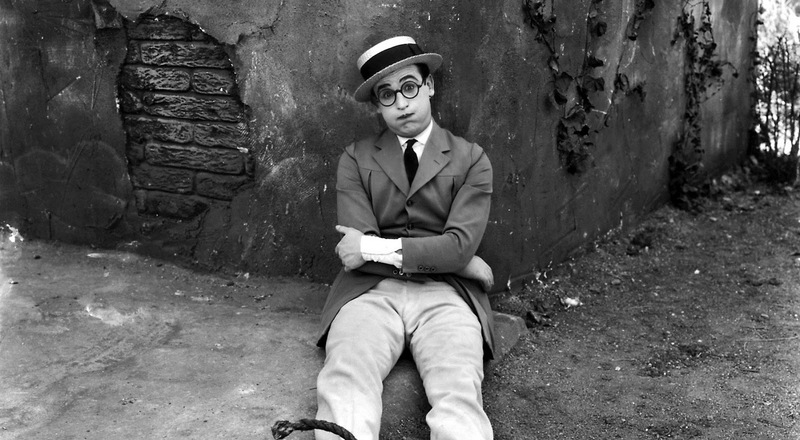 The year is 1913, the young man Harold Lloyd. The actor was dogged, inventive, self-made, compensating for what he lacked in experience, training or talent with sheer energy, bounce, and push. It hadn’t occurred to him yet that he would someday play himself. 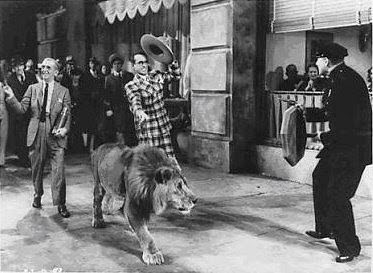 Lloyd’s entry into the studio that day—and therefore the movie industry— reads like a partial scenario for one of his later films. “He can do anything he tries,” the smitten sweetheart says in the first reel of Never Weaken (1921). It is not only her love for Lloyd’s character that engenders this type of unquestioning faith. Harold the character, as well as Harold the actor, could do most anything he set his mind to. In his best thrill comedies, he generated sympathy not only because he was liable to drop to his death at any moment, but also because he simply refused to. In film after film, Lloyd put himself in danger and emerged unscathed; he got the money, got the girl, and, most importantly, got ahead. His trials, tribulations, and ultimate triumphs spelled the facet of the American Dream on which his mass appeal was built: a mediocre individual and how much he can accomplish through the right combination of hard work, luck, and pluck. A perfect example of his unwavering climb (this time to success and popularity rather than up a skyscraper) presents itself in the narrative of The Freshman (1925), directed by Frank C. Newmeyer and Sam Taylor. A small-town young man with wildly unrealistic dreams of college, Harold Lamb—and what better name could underscore his innocence—seems the least likely person on the planet to become popular, but giving up is a foreign concept to him. By the end, he has everything he ever wanted: his classmates’ respect and adoration and a beautiful girl who loves him. The future has never looked brighter; there is no way this young man will not win in life as he did on that football field, or even, hopefully, taking fewer falls and hits. 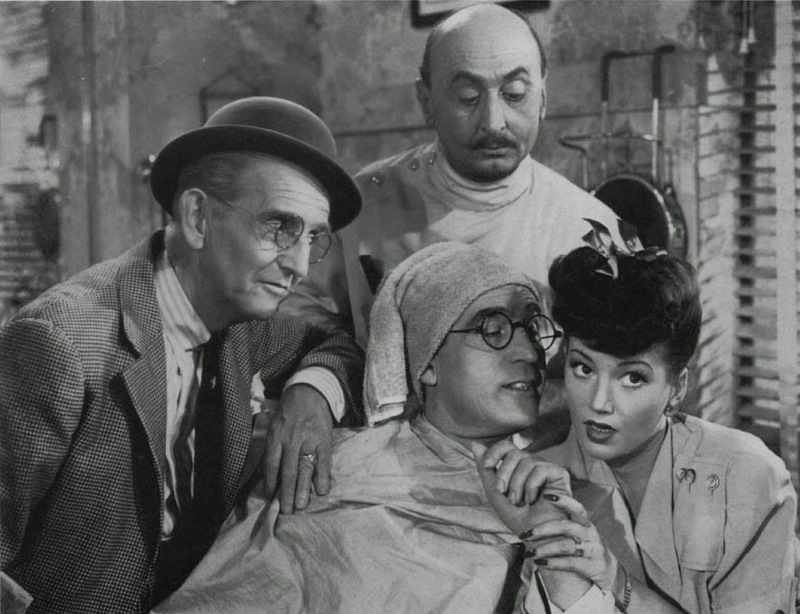 Twenty years later, in Preston Sturges’ characteristically disenchanted Mad Wednesday (1947), the once hearty and hopeful Harold, now bearing the purposely bureaucratized last name of Diddlebock, is slow, broken, bent, a sad parody of the dreams he had as a boy, of Lamb’s triumph as well as the falsity of idealistic American clichés that triumph was built on. Lloyd’s silent characters embodied the hopes of the nation in the twenties, but his naïve optimism had no pull on a post-Depression era audience in the sound period. The homely, small-town values had betrayed him as well as the viewers; the tools required for success in this world—significantly, in Sturges’ film an urban one—were of a much more cynical nature. In The Freshman, Lloyd takes us back to those beautiful boyhood days that never were, when “going to College was greater than going to Congress—and you’d rather be Right Tackle than President.” As the movie opens, Harold is upstairs in his room dreaming about his upcoming trip and trying to prepare himself for the rituals of an unfamiliar life by pouring over books on how to play football, college yearbooks, and a dubious collection called “College Yells,” which he dutifully rehearses in the mirror. Perhaps saddest—and funniest—of all, he has seen his favorite movie, “The College Hero,” six times and has learned to imitate every one of the preposterously romantic postures of the protagonist, the actor’s lines, clothing style, the ridiculous little jig step he does before meeting anyone as well as the greeting itself: “I’m just a regular fellow, step right up and call me Speedy.” Speeding up the image to make his character look even more frantic, Lloyd creates sympathy for Harold; we can imagine what results his intricate preparation will have on his classmates. So can his parents: “I’m afraid, if Harold imitates that movie actor at college,” his father says, “they’ll break either his heart or his neck!” They do, indeed, come close to breaking both, but not close enough to make Harold give up. 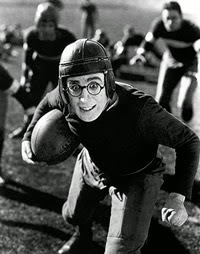 From the moment he steps off the train at Tate University—“a large football stadium with a college attached”—into a crowd of upperclassmen gleefully reuniting, “Speedy” is out of place, despite his confidence that, being so knowing about campus ways, he’ll be captain of the football team, president of his class, and most popular student. The crowd dissolves into back-slapping twos, trios, and fours, and Harold is left alone in a heartrending long shot that underscores his isolation. He’s not quite alone, though. He has, in addition to his golf clubs and ukulele (! ), the campus bully’s undivided attention, who points Harold out to his friends. Instead of ridiculing him openly, they feign admiration, beg him to do his jig step, and trick him into addressing the entire student body in the auditorium before the dean can arrive—Harold unintentionally steals his car and driver, which take him straight to the stage entrance. Once inside the auditorium, Harold climbs up to get a stranded kitten down from the stage curtain rod. When the bully parts the curtain, presenting Harold to the audience and it to him, he is so shocked he stuffs the kitten down his sweater to hide it. Fumbling, his vision blurred by tension—as per an unfocused point of view shot—he tries to find his words, finally settling on “I am here, er, yes, there is no doubt that I am here.” Yes, he is, and, knowing Lloyd, he’s here to stay. Getting his wind, he launches into the kind of uplifting rhetoric he has learned from the movies. The crowd, quickly realizing he is a fool, applauds him wildly. Satisfied with his speech, Harold invites his new “friends” out for ice cream. In a masterfully composed tracking shot, we see the group steadily growing in numbers with each step—the flip side of Truffaut’s famous tracking shot in The 400 Blows—until it encompasses the entire auditorium crowd—of course, the ice cream is Harold’s treat. At once virtually penniless, Harold must give up his comfortable campus housing and move into the attic room of an old, dusty boarding house, where the character is bound to be lonely. Dismayed but resigned, he sets about tidying up the place, starting with a mirror that is completely clouded over by what looks like years’ worth of accumulated grime. Getting a rag, he goes to work on the mirror, moving outward from the center. As he completes the central circle, he stops and stares at what he has wrought. In the mirror stands the girl of his dreams, Peggy, “the kind of girl your mother must have been.” Because of the carefully chosen but utterly unforced camera placement, we are as surprised as Harold to find the young woman materialized as if by magic behind our hero; he has managed to summon a friend out of thin air. As played by Jobyna Rolston, who combined some of Bebe Daniels’ tomboyishness with Mildred Davis’ sweetness, Peggy is simultaneously vulnerable and assertive, the perfect leading lady for Harold’s glasses characters. In accordance, Harold begins fussing around this girl in his very specific way, perhaps revealing and strongly exteriorizing the normal levels of discomfort any pure, American boy ought to feel in the presence of a lady. 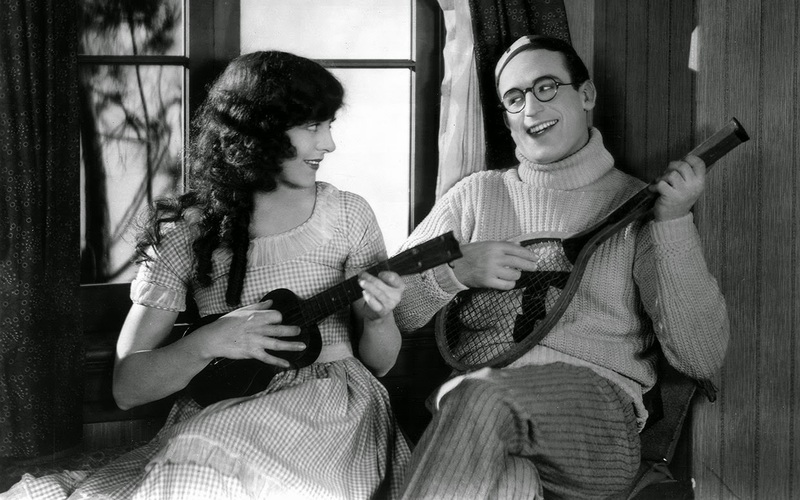 Lloyd generally crossed his legs and got very, very busy, a behavior that was to become the trademark of all his on screen romantic relationships. In The Freshman, he simply sits down beside Peggy, who is sewing his shirt, and, unable to keep his eyes off her, looks down, only to be stabbed in the throat with the needle with each loop of the thread. The sadness and dejection the character felt before Peggy’s appearance could have been deepened into a poignant exploration of the injustices innocents like Harold have to suffer if they do not conform to what a college society deems popularity-worthy. That kind of sentiment, however, is not what Lloyd trafficked in during his highly successful career. In contrast to Keaton or Chaplin, Lloyd can be described as a great comedian—as opposed to a great artist that simply used the comic form. His films deal in comedy of surface, often with very little beneath. After establishing Harold Lamb’s comic flaw—his desperate desire to be liked, even by presenting himself as something he is not, demonstrated by the silly jig step topped with the idiotic line he’s memorized—the film makes a complete reversal. The character, discovering people only pretend to like him, that they mock him and snicker behind his back, that they spend their time with him only because he spends his money on them, that he is only the water boy on the football team, doesn’t change his behavior in the slightest. He merely tries harder to adopt the campus community’s values. No comment is made on the shallowness and obtuseness of these values in the first place. But if Lloyd’s artistic vision, his view of human life, and handling of social realities left something to be desired, his gags did not. The actor’s work benefits from tight narrative lines, an expert control of rhythm and pace, and carefully crafted, generally lengthy sequences that are brilliantly funny. Despite its social banality and moral contradictions, The Freshman is no exception. 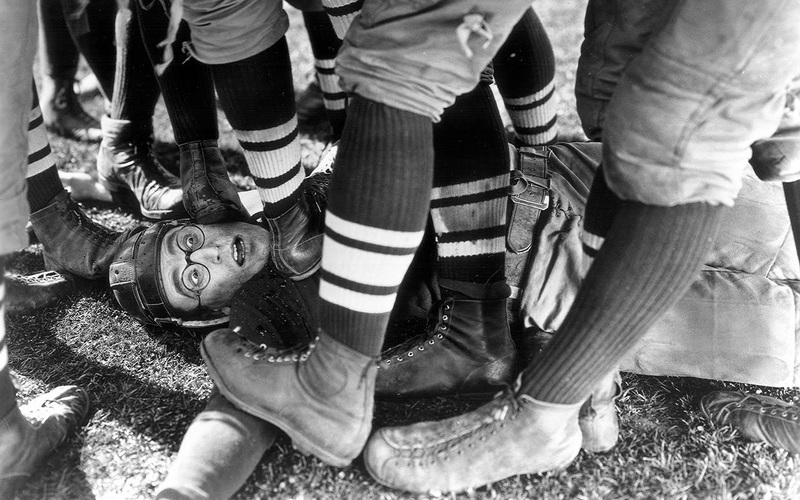 One of the great comedic sequences in the film takes place on the football practice field, “a place where men and necks are nothing.” The head coach, a man “so tough he shaves with a blow-torch,” reprimands the team for their performance on the field—or lack thereof. Chet Trask—a college football star name if there ever was one—presides over the players with all the authority a man with a giant “1” on his jersey is wont to command. As Harold peevishly walks in behind the coach and Chet moves further back, the coach ends up pointing at the main character and telling the team, “There’s the man to model yourself after…. He’s worth more than the bunch of you[,]… a regular go-getter, a red-blooded fighter, the kind of man that Tate is proud of.” Turning around, the coach realizes his mistake and quickly dismisses Harold. On second thought though, perhaps he could be of use. Harold returns triumphantly, only to discover he is to replace the battered, broken tackling dummy—much better practice for the players. Again and again, the character gets bashed and gets up, gets bashed and gets up. “This is no petting party. That’s not half hard enough,” the coach yells at the football team while a distraught Harold watches from the ground. The character’s reaction shots, quick closeup cutaways from the main action, comprise much of the comedy. “Never tackle a man this way,” the coach instructs as his arm tightens around Harold’s neck; “you might get hurt.” Then he demonstrates proper form, knocking the hero down and jumping on top of him—“See? That didn’t hurt me a bit. Besides, if you tackle high, they’ll get you with the straight arm.” We know how the straight arm will be demonstrated. By the end of the practice, the shadows lengthening on the field, a woozy Harold tries to pick himself up. He grabs the leg that is bent beneath him, unfeeling and lifeless as straw. Pulling the leg completely off, he stares down in disbelief, suddenly realizing that it is straw, the tackling dummy’s appendage and not Harold’s. The character stands up to reveal, to his surprise (and ours), that he is still in one piece. Lloyd’s brilliant camera angle keeps the leg in exactly the right position to make us believe a man could mistake it for his own. 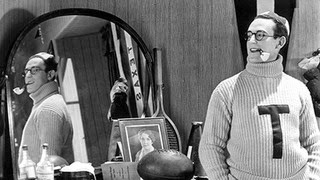 After practice is over, however, Harold still offers to help the coach clean up, tells him what a great workout he’s had, and does a half-limped jig step before crawling up the steps to his humble apartment. The football players might have almost broken his limbs and back, but they can’t break his spirit. 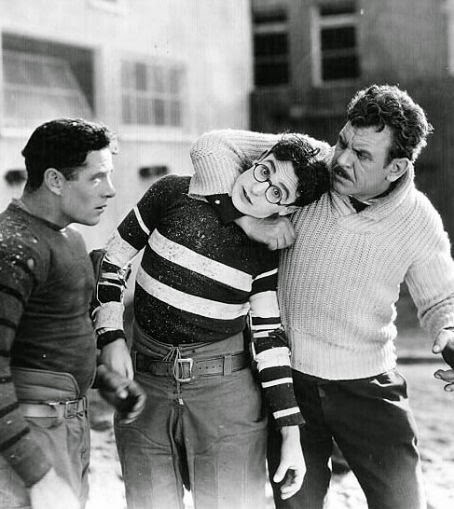 Like the armed tramp he apprehended (by reducing to exhaustion through the sheer persistence of the chase) in Grandma’s Boy (1922), the collegians in The Freshman stand no chance against Lloyd’s patient perseverance. He can’t join them and he can’t beat them, but, by God, he can keep going at them until they just give up. Each of The Freshman’s major gag sequences is longer, more complex, better developed, and funnier than the one preceding it. Since everyone on campus is in on the fact that Harold is not the college hero but the college joke, when it is time for someone to proclaim himself host of the Fall Frolic—footing the bills as well—Harold, given his standing, feels it is his duty and obligation to do so. The character orders his tuxedo for the big dance, but the tailor, given to dizzy spells when not in the immediate presence of alcohol, is only able to stitch it loosely instead of sewing it securely, and he offers to come along to the party in case anything happens to rip. Lloyd has planted the seemingly irrelevant, incredible seeds for the gag sequence, and now he reaps the rewards. When Harold lifts his arm to wave, the sleeve rips. When he goes to take his handkerchief out of his pocket, the pocket comes off with it. When he buttons his jacket, the back seam splits. The tailor follows him around with a sewing kit all night, going to ridiculous lengths to go unnoticed—which range from crouching behind Harold to fix a tear, to a much more complicated strategy that involves ringing a bell if anything else comes undone. Of course, every table has a bell on it, continually rung to summon waiters. Harold, pulled and pushed on the dance floor, grows increasingly concerned, his eyes bulging out of his sweating brow and his hands fumbling to find a rip every time he hears a bell. At the end of a dance, his sleeve leaves with his partner, attached to her dress like a tail. When Harold is backed up against the curtain to fix the sleeve, the college bully walks by to ask for some money. The tailor intervenes, pushing his arm forward through the curtain to pretend it’s actually Harold’s. When he places ten dollars inside the bully’s pocket, a third, unsleeved arm appears from behind the curtain to retrieve the bill. Talking to another lady, Harold nervously twirls a thread in his pants, and the seam opens. When he backs to the tailor’s corner for a hasty repair job, the sequence is brilliantly and hilariously staged. Harold is apparently sitting at a table with a woman making casual conversation; the camera moves to reveal he is in fact lying face down on his seat, his legs spread behind him through the curtain that hides the tailor. When the man has another dizzy spell and falls against Harold’s legs, the main character slowly feels himself dragged down under the table in the midst of a polite conversation. Seeing Peggy, who is working the coat-check concession, smelling the bouquet of flowers he has given her, Harold walks up to her and, every hint of shyness and awkwardness gone, kisses her. When she reciprocates, his chest swells with pride and the buttons of his suspenders pop off. Quickly, all the buttons go, and, with no better option at hand, Harold stuffs a fork through the excess fabric to tighten the pants. What he doesn’t realize is that he grabbed the table cloth along with the item of silverware, and the beautiful table arrangement comes crashing down as he walks away with the cloth for a train. When a waiter tries to right this situation, Harold is left, predictably, without his pants. The entire sequence, a model of visual and comic inventiveness, presents a perfect blend of rhythm and information, giving us the ripping pieces in closeup without obscuring the comic human focus of the whole. The end of the scene, however, turns from comic to (almost) tragic. The students have spent a gala night dancing and drinking at Harold’s expense and keeping their true opinion of him a secret. At the height of the party, the college bully tries to force himself on Peggy. Harold instantly snaps into action to protect his girl; preparing for battle, he takes his jacket off (in five pieces) and single-mindedly marches to the rescue. In a stunned rage, he knocks the bully down, whereupon he’s venomously informed of everyone’s actual opinion of him and the vicious inside joke his life has become. Harold looks at Peggy, whose quiet, ashamed glance tells him it’s all true. An image of rueful dejection flashes across the screen, an image of a nice chap distressed that he is no more than he is, mouth almost squared in pain, head bent slightly to one shoulder. As soon as it appeared, the image is gone; to stop Peggy’s tears, Harold pretends not to care, forces a shaken grin, and gives the most indifferent shrug he can manage. It is Peggy’s turn to be candid, scolding Harold for pretending to be something he’s not for so long, convincing the hero there is only one thing wrong with him: he has never been himself. Fired by her faith in him, he promises to set everything straight and show them what he’s made of in the next day’s climactic football game. The big game against Union State is the film’s ultimate comic sequence. With thirteen minutes left, Tate is trailing behind 3-0. Players are dropping like flies. There are two substitutes left, one of which is Harold—it is as yet unknown to him that he is only the water boy. The coach motions to our hero. He runs onto the field, where he is ordered to take off his jersey (number 0) to replace one that has been ripped. He walks back to the bench, and I don’t think I’ve ever seen anyone so hopeful for an injury to occur. When the other substitute is put into the game, Harold expectantly waits; at last, someone gets hurt. He gets up and prepares to play. He is told he is only the water boy. He gets mad. And when Harold gets mad, Harold does things. “You listen now,” he tells the coach; “I’ve been working—and fighting—just for this chance, and you’ve got to give it to me.” He demands to be taken seriously and to be offered an opportunity to prove himself with all the confidence of a man who knows he will succeed. Impressed—and, frankly, out of options—the coach agrees. Without his jersey on, Harold is the only player wearing white, a significant visual contrast to a field saturated in black. “Come on, you old women,” Harold urges his teammates. “Don’t you know how to fight?” If there’s one thing the character knows about sports—and life—it’s how to take a hit and get back up. After a rousing speech, the game is resumed. It takes the whole of two seconds for Harold to be laid flat on his back. Waking up on a stretcher, however, his first impulse is to run back to the field. Trampled on again, knocked out of the way like nothing more than a pestering fly, he refuses to admit defeat. His characteristic good fortune follows him onto the field; when he sits on the turf, a pass drops into his lap. As he runs for another pass, a fan tosses his hat. Harold grabs the hat and races for a touchdown. Later, as the ball once again floats towards him, a vendor releases a load of balloons. Harold scans the sky for a football coming his way and seems to see a dozen balls bobbing in the air. When Harold finds the real one, he unties its string and twirls it like Yo-Yo, a strategy so successful at fooling the enemy he almost scores a touchdown. As he is about to cross the line, a factory whistle blows; Harold thinks the game is over and drops the ball. But, still, he does not give up. With only seconds left on the last play of the game, he blocks a punt. A Union State player picks it up, but fumbles. Harold scoops it up and runs. When State players try to bring him down, he drags them towards the goal. The players pile up. The gun goes off. When the human jumble is unpiled, the ball lies over the line. Tate has won because of Harold, who now receives a ride off the field on the shoulders of his teammates. After bringing victory, he becomes a hero, and the entire campus imitates his jig step prologue to shaking hands. In the locker room, he gets a love note from Peggy. Reading it, he leans against the shower and turns the water on, soaking himself. Fade out. Harold Lamb might be wetter by the end of the film, but he is also wiser. Or at least that’s what we’re supposed to believe, although he changed close to nothing in his behavior; he only became more vocal about it. If the ending seems contrived today, it is only because we haven’t shared Lloyd’s times and assumptions. By the release of Mad Wednesday, the Great Depression and a World War had intervened. In the interim, the myth that was so strongly believed in in the twenties—that of the good, honest American climbing to success through pluck and luck—had slipped away. Success was no longer a matter of determination and hard work, but a much more cynical outgoing parade of irresponsibility, trickery, and bluff. Sturges’ Mad Wednesday (a.k.a. The Sin of Harold Diddlebock) opens where The Freshman left off, quite literally; its first reel is the last one of Lloyd’s silent classic. Adapted to sound, the crowd cheers for Harold’s win, among its members businessman E.J. Waggleberry. Carried away with Tate’s victory, Waggleberry offers young Harold a job in his advertising firm after he graduates. “I may not look like it,” the man says, “but I am opportunity.” Here’s another small triumph for Harold to add to its list, one that we hope will include many more to come. It won’t. Harold is thrilled to be offered this opportunity and ready to climb to the top on his own merits. He says he doesn’t know anything about the ad business, however. “Good!” Waggleberry says. “Then you won’t have anything to unlearn! You’ll be able to start right in the basement and your rise will be all the more spectacular.” Harold is full of ideas for his future job, practically bursting with them. “Contain them,” he is told: “The idea department is a little congested at the moment. It always is, for that matter. There never seems to be any shortage of… oh, but that will only depress you.” Instead, he is offered something much, much better: “a little nook in the bookkeeping department, a regular little niche; you can almost call it a cranny.” Waggleberry explains this is exactly what he had always wanted, you see, but his father unfortunately left him the business—“Just one of those things,” he says regretfully. Already getting busy, Harold takes up his place at a desk, covering the entire wall next to it in signs bearing slogans like “Success is just around the corner.” He will soon find out, as his future friend Wormie will say, that, in reality, the only thing just around the corner is posterity. The camera pans right to a calendar; the dates change until it reads 1945. Sturges returns to reveal Harold sitting at the same desk, doing the same job, with the same stupid signs on the wall behind him. Time has erased any trace of the youthful promise Harold once presented, burying it under years of bureaucracy and the proven falsity and idiocy of those American clichés tacked to his wall. Defeated and slow, his voice feeble and cracked, his their thinning, Harold is forcibly ‘retired’ by his boss in yet another two-faced speech, given the inevitable gold watch and the two thousand dollars that represent his life’s savings—he had more, but he invested in his own company and lost it all in the market crash. Still a lowly clerk—who has loved and lost a total of seven beautiful sisters in turn—Harold Diddlebock has wasted the one thing he had to begin with: his ideas. “You have not only stopped progressing,” he is told, “you have stopped thinking. You not only make the same mistakes year after year, you don’t even change your apologies. You have become a bottleneck.” Mad Wednesday functions almost as the slapstick equivalent to Death of a Salesman; for the first time on screen, we see Lloyd has stopped moving forward, and the image is heartbreaking. Realizing everything he has ever believed, platitudes as well as ideals, has betrayed him, Harold goes “mad” and does everything condemned by the small-town spirit: he falls in with city slickers, he drinks hard liquor—one of the movie’s funniest scenes presents a high-pitched, strangled screech that sounds like “a cross between a Mongolian link and a wounded moose” as one of the effects of alcohol on Harold—he blows his savings, he bets on horses, he buys the loudest checked suit and biggest hat he can find, he bullies bankers with a lion on a leash and gets arrested for it. And, in the end, he is a success. “Speedy” has managed, once again, against all odds, to win; the money, the girl, friends, respect—whatever it is that he wanted he got. But his relinquishing of the values that his accomplishments were built on speaks to the values that govern a modern world, as well as the unreality of the pure image Lloyd created in the silent period. Perhaps Mad Wednesday even functions as a comment on the shallowness of the glasses character’s goals (success and popularity) in the first place. Whatever its accomplishments, Struges’ film demonstrates, above all, that the actor’s gifts, like his beliefs, were not suited to a post-Depression era and a cinematic universe filled with talking and noise. But even if the classic Lloyd character and, to some extent, Sturges’ version as well lacked hints of introverted depths, the comedian managed a complete identification with the values of the times. Early in his career, Lloyd dropped the search for a comic image larger and stranger than himself to offer his own determined ambition as image enough. He didn’t create an outsized figure sufficiently bizarre and ambivalent to function as myth, falling instead, because of who and what he was, into a myth that already existed: the myth of the good American, one still devoutly believed in in the 1920s.This hero was aggressive and innocent at once, possessor of callous ambition as well as a clear conscience; his energy and determination were virtuous energy and determination, born out of the noblest motives and spent in the cause of good. A bespectacled, benevolent and brash boy whom nothing could defeat, or even deter, he was all the while a shy and awkward boy whose very naiveté seemed to stem from an excess of good will. With a dual belief in vigor and virtue, striking the ideal balance of guts and goodness, he embodied a national archetype. In Girl Shy, made a year before The Freshman, the titular girl finds herself on the way to the altar, about to marry the wrong man, with Harold miles away. The character races feverishly to the rescue by motorcycle, streetcar, and horse cart; snatching vehicle after vehicle in his rush, he leaps into an empty car which is immediately towed away backwards. The image is independently amusing, original and self-contained, but most of its force and our amusement comes from the sheer incongruity of Harold—in any setting—moving backwards. His trajectory in films as well as real life moves ever onward and upwards on his way to the top (of buildings or otherwise) as all good American were expected to do. The climb might be harder twenty years later, the methods less innocent, the dreams less virtuous, the results less innocuous, and the audience less likely to wholeheartedly accept his accomplishment, but Lloyd again makes us believe that wherever he wants to go, he will get there.